12 November 2018, 13:01 p.m.
Research from the world's largest job site Indeed has found Brexit is having little impact on the UK’s ability to attract tech sector talent. Among the many fears spread about Brexit was the UK would struggle to attract needed talent from around the world to fill high-skilled roles. Brexit supporters have called for a ‘fairer’ system which no longer prioritises European immigration over anywhere else. Instead, advocates want a skills-based system to focus on filling roles unable to be filled by UK citizens. 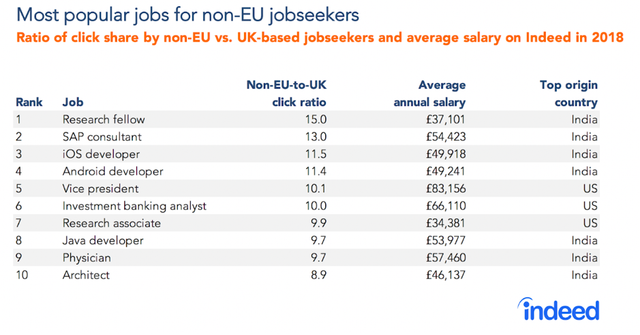 One in 10 enquiries about British tech jobs comes from jobseekers outside the UK, with interest strongest among non-EU countries. The EU has been declining in world economic performance as poor socio-economic stability continues to plague the continent. Figures from the IMF show the EU’s share of the world economy was 30% in 1980 and is expected to continue declining to 15% by 2022. According to Indeed’s research, India is the top source of non-EU talent for the most popular jobs in the UK. This is unsurprising as India has quickly established itself as an IT superpower as well as producing renowned talent in areas such as medicine. Based on the research, the UK government’s decision to prioritise a post-Brexit trade deal with India appears to be warranted. “India’s emergence as an IT superpower has produced large numbers of highly-skilled tech professionals, on whom Britain’s booming £184bn tech sector has become increasingly reliant. Indeed’s data reveals that a fifth of Indian jobseekers enquiring about UK jobs during the first nine months of 2018 were interested in tech jobs. Bank of England research indicates free movement has benefited the UK overall but has slightly depressed wages of low-skill workers due to entry-level work being undercut by exploited labour from poorer countries. Since the Brexit vote, European immigration has decreased amid uncertainty. 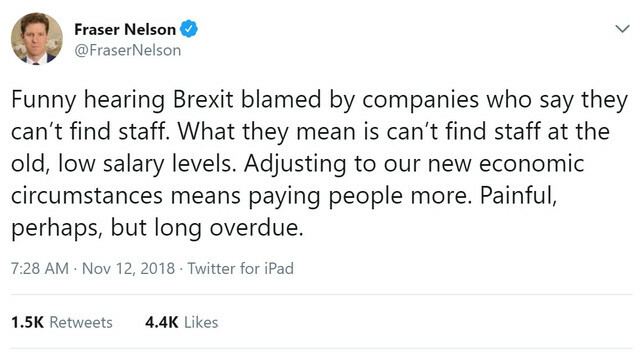 Increased demand for labour has led to UK wage growth at its fastest for nearly 10 years while unemployment is at its lowest since the mid-1970s. However, inflation remains high following the pound sterling’s devaluation in the aftermath of the EU referendum. The pound has been making gains in recent weeks amid speculation a post-Brexit trade deal is close but remains far off its pre-referendum highs. With its class-leading universities luring international students and producing experts in areas such as AI, investments and new headquarters opening from tech giants, the language of business on its side, and unparalleled diplomatic links, it seems more than leaving the EU will be needed to stop the UK being a magnet for tech sector talent.